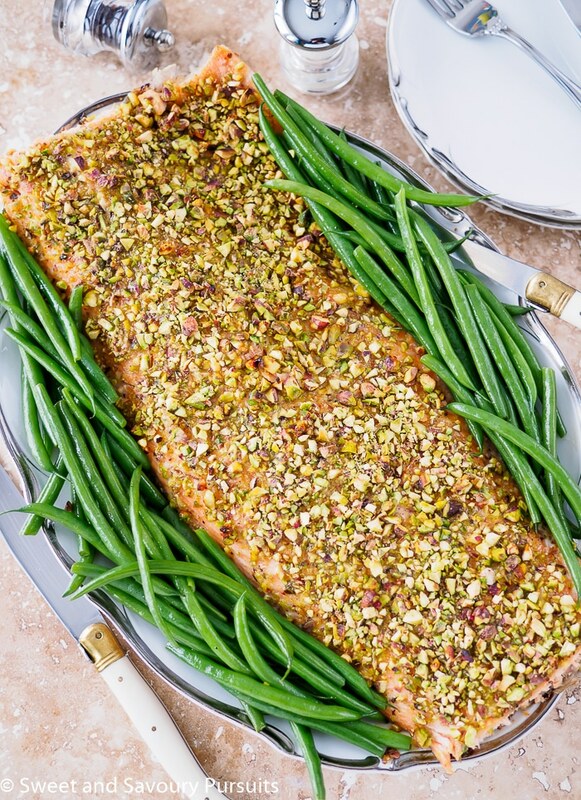 With a few simple ingredients and less than 30 minutes, this Pistachio Crusted Salmon is both an easy and quick option for a weeknight dinner and also an elegant main for a dinner party. This recipe for Pistachio Crusted Salmon is one of those simple recipes that produces a beautiful and flavourful dish that is sure to impress your guests. Salmon is a healthy dinner option and this recipe is so easy and quick to prepare. With some basic pantry ingredients you can have this delicious and moist fish on the table in less than 30 minutes. 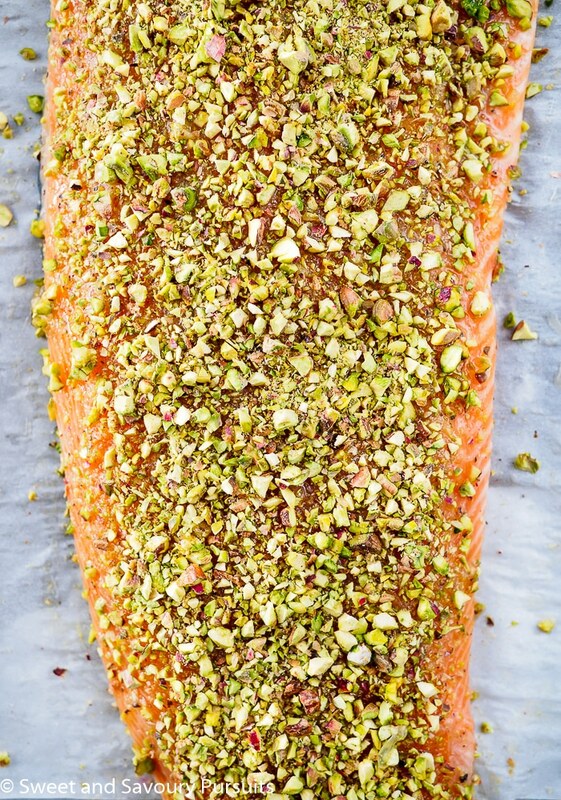 This recipe takes a fresh salmon fillet and coats with a bit of honey (or maple syrup), garlic, salt and pepper and some chopped crunchy pistachios. If you don’t have any pistachios on hand feel free to use chopped cashews, pecans, almonds and even peanuts, they all make excellent coatings. Bake the salmon in the oven for approximately 15 minutes and it will come out with a moist and juicy flesh. If you are using a smaller fillet make sure to check the fish earlier than the suggested time as a smaller fillet will cook faster. Steam some fresh veggies to serve with the salmon and you have yourself a quick, easy and delicious meal. Place a rack in the middle of your oven and preheat it to 375F. Line baking sheet with parchment paper. Pat the salmon dry. And rub flesh with olive oil. In a small bowl, combine minced garlic cloves and honey, spread over salmon. Press chopped pistachios onto salmon flesh. Bake in oven until flesh flakes easily about 15 minutes. Remove from oven and let rest for 5 min. before serving. Keep in mind that the fish continues to cook when its removed from the oven, so make sure to take it out sooner rather than later. Hosted the neighborhood Christmas party – looked for something easy and delicious! This was it. I have to say I did not think it was going the be as great as it was. Everyone said it was delicious – I have to agree! So if you'[re having folks over and want to impress them – this is the recipe to prepare. Fast – appealing -and above all delicious! Thanks so much Phil for letting me know how much you liked this recipe, I’m glad everyone loved it. Your comment made my day! Can you prepare this 1-2 hours prior to baking and keep in refrig? Hello Peggy, yes that’s fine. Though you should take it out of the refrigerator and let it sit at room temperature 15 minutes prior to baking. This was a simple and delicious dinner. Perfect for this busy time of year when you want to serve your family healthy food but don’t have much time to cook. Thanks for a great recipe! I’m so happy you enjoyed it, thanks for letting me know! Well done looks amazing, thanks for the idea. What a beautiful, healthy meal for the new year! Sounds wonderful! Wow! What a gorgeous dish! I LOVE salmon so I’m always looking for new ways to prepare it! I have yet to try it with a pistachio crust so thank you for this wonderful recipe! Thank you Kathleen. I really think you’ll love the pistachio crust, give it a try when you have a chance! Woowwwwww this salmon looks incredible! I love the fact that you used pistachios here, I’m sure they lend a unique and tasty flavor along with the fish! Thank you! 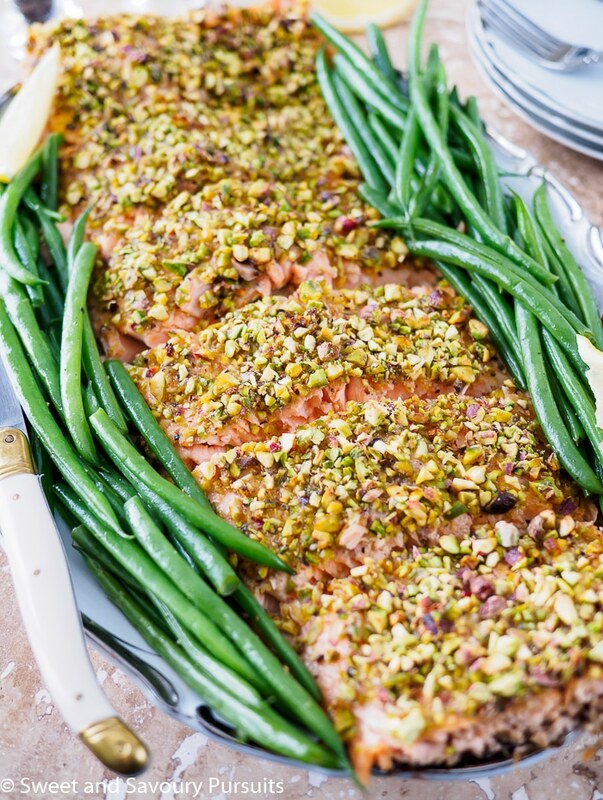 The pistachios add a great contrasting texture to the salmon, it’s all so delicious together. A beautiful dish…I know guests would certainly think it is a special meal. Thanks Simon! I think this would be delicious grilled on the bbq.